We teach Biblical Healing, Which Bible?, Jewish Roots, Endtimes, Spiritual Warfare, Creation, etc. We want to bless your church by presenting sound Apostolic Biblical teachings. Would your church consider scheduling one of our conferences? 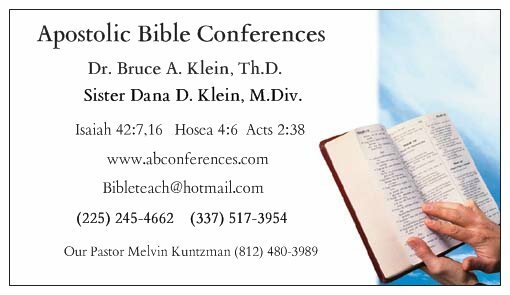 We can present Biblical presentations to your church about many Biblical topics. Dr. and Sister Klein are of Jewish descent. Knowing deep spiritual truths develops ones faith and helps a Christian to better understand Jesus Christ. We want to bless your church by presenting sound Biblical teachings. We want to help you build friendships with your Jewish friends, so you can give them the Gospel. Would your church consider scheduling one of our presentations? Knowing the Hebraic Roots of our faith helps a Christian to better understand Jesus Christ.